Do you agree with proposed changes to child ratios? The announcement to implement radical plans to offer parents childcare tax breaks of up to £2000 per child every year has been postponed and is expected to be scaled back. In an effort to decrease fees an increase in child to carer ratios has now been proposed. The current limit of one member of staff to every four toddlers will increase to six toddlers per one member of staff, and babies to 1:4. The changes in ratios will nearly double the amount of toddlers nurseries can care for in an aim to cut childcare costs. A Whitehall source said: “Childcare in England is too expensive and often not good enough. According to the Telegraph, the change in ratios has created a higher demand for the level of teenager’s nursery training to increase. Teenagers will be required to have at least a grade C in GCSE Maths and English to prevent children being looked after by staff who “struggle to read stories aloud to them”. However, many parents are wondering if the government should be investing more into support for lower childcare costs, rather than altering ratios of childcare workers, and will this change impact on the quality of childcare? Do you think that changing ratios is the way to approach the reduction in fees? Share your views by commenting below on this radical change. These comments have been made based on your own experiences. The proposal is a good idea as it will allow more children to come into nursery settings and this will mean that the buisnessess will be earning more money. this way they can afford to pay the childcare practitioners more money and greatly increase the economic situation in this sector. The other comments talk about using their brains however i feel that some of them will need to take their own advise! This is a ridiculous suggestion if there is a fire how is one adult meant to evacuate 4 non-mobile babies safely especially when most baby rooms in my experience are on the first floor! Children won’t receive quality care either and there will be more people unemployed which defeats the whole point of what they are trying to do. Do these people actually think before they suggest these things because it doesn’t seem like they do. I will not work in childcare anymore if they put this into place because I know I will not be able to give the care children deserve and that is unacceptable! Looks like this proposal has been made by someone who knows nothing about care or quality. This proposal will only lead to disaster for the children who are the future of this country. We, at this Day Care already operate above the ratio because we want to give our children the best possible life chances in life which will help them grow in confidence to go out into the wider world having reached their full potential. 80% of development occurs between the ages of 0-5 and this important fact has been overlooked. The EYFS states that every child must make good progress and that no child is left behind. How can one achieve this if there are not enough adults to manage this. Furthermore, this will create more unemployment by some nurseries not taking on extra staff to cover new intakes and also make some staff redundant. The safety and well being of our children and leveles of quailty interaction would be compromised. There are a number of factors to consider, younger children need more care, 1-3 in babies is hard enough and sometimes it feels all you do is annpy change and feed add more children and thats all you will be doing. looking after children is demanding and the government expects more and more from us yes I totaly agree wages need to be improved, you pay more for someone to work on your car than you do on child care per hour, our responsabilities are endless yet we do not get recognised for the important work we do. im all fopr raising standnards but ask the childcare workers not make snapp judgments and recomendations that will have a huge impact upon the level of care our children recieve. Lowering ratios will not increase the number of high quailty childcare places available, as, in my opinion, any lowering of the child:adult ratios will decrease the quality of childcare practitioners are able to provide. I do not know where to begin as the new ratios are absolutely unbelieveable. I totally agree with all that has been said by the above responses. How are we going to offer a safe, stimulating and caring environment? Does Liz Truss know what is is like to care for two babies let alone four!….. especially when they have learnt to explore their surroundings! Come to that has she ever visited a nursery! Thank goodness we all believe in high quality childcare and will ignore this latest Govenment whim. Well what can I add! I hope these views will be made clear to the government! Resounding response to increasing ratio’s from the professionals who work with them is NO!!!! We’ve worked tirelessly during the past decade and more to improve standards, based on current and relevant research – much of which was funded by Government, so why on earth is anyone in a position of power suggesting such a short-sighted proposal! Madness! Just demonstrates that despite all the “talk” about the importance of Early Years in terms of future leaning and development, the reality is that – Children in the UK still don’t matter to those in power at all! I Have worked in a day nursery for 8 years and feel a change in adult to child ratio would be very difficult and not fair to the staff or more importantly the children, I work with 2 year olds and with nappy changin and potty training even a 1:4 ratio can be a struggle at times. If the ratios increases it means some staff members wud have to leave due too not being needed anymore which leads to more people being unemployed. The government wouldnt benefit as childcare practitioners wud need a pay rise if they have even more responsibility!!!!! Loads of brillant childcare practitioners would quit too as it would jus be too much!!! Has this proposal been made by someone who knows anything about today’s children and what is expected from providers today. Firstly, children require good support and the proposed ratios do not allow for that in the younger age groups. At this Pre-School we go above the ratios required because we feel that a greater ratio of children to adult does not allow for children’s individual needs to be met. An increase in ratios of children to adults would stretch the staff’s ability to provide for individual needs as given in the EYFC. Secondly, the current funding level does not allow for staff to be recognised for the work they do. How much per hour does a parent pay for their car to be repaired/looked after, compared with how much per hour it costs to look after their child? The Government needs to provide more funded hours for children if they would like to keep parents in work. Increasing ratios is not the answer. As a high quality setting, we already operate below the maximum ratios and have no intention of working to the maximums with or without the proposed changes. Our Ofsted registration states the maximum number of children we can have in our setting at any one time and this is based on physical space (m2 per child). We are currently registered for 16 children – this will not change as our room size has not changed or are there proposals afoot in this area as well? Therefore, we will not be able to offer any more physical places in our setting than 16 but technically we could reduce our staffing with the proposed new ratios. Is this really in the best interests of the children, staff and parents? As recently as September 2012, the revised EYFS came in to force. Are we about to have another expensive, time consuming review or will it be done piece meal e.g. ratios first, premises next, then what? The EYFS requires that “… every child makes good progress and no child gets left behind”. This is achieved by treating each child as an individual, understanding their needs and interests and ensuring learning and development opportunities are planned around each child. This is at the same time as giving each child time and space to initiate their own learning and development whilst practitioners observe them at play and measure progress through assessments and discussions with parents. Having sufficient time to do this effectively is already a challenge. The proposed ratio changes could well lead to some settings cutting staff to reduce costs and this would inevitably lead to heavier burdens on the remaining staff. A ratio of 1:6 for toddlers would be detrimental to the quality of care for each of those 6 individual children. Practitioners know and understand how a typical day with two year olds works in their settings – comforting, nappy changing, feeding, playing, story telling, positive interactions between adults and children and between children and children, positive development of social and emotional skills, behaviour guidance and management, observations, assessments, planning, progress checks which may or may not reach a Health Visitor, working alongside parents, training, keeping up to date with legal requirements, reflecting and improving on practice whilst ensuring each child has opportunities to reach their full potential. Suffice to say that one person looking after 6 two year olds will lead to one exhausted adult and six young minds which are not getting enough positive adult influence during their time in the setting. Our children deserve the best care and environments we can offer. Early Years practitioners are now expected to achieve higher levels of qualifications and act as professionals. We strive for the best for our children every minute of every day. When will this be recognised? Parents already have a tough enough time ‘handing their children over’ to others to provide the care and nurture they would like to be able to do themselves. Let’s not make it harder for them by reducing the amount of quality adult interaction their child receives. Let’s consider what children really need – investment in quality settings which support the child, parents, families, staff and the local community. Our next generation need to be equipped to be able to contribute to society in a positive and productive way – it starts in the Early Years. I agree that an increase in the child to adult ratio for toddlers would result in less time available for individual children. However it is possibly manageable, but the resulting extra paper work with regards to the two year old summary is an extra burden on individual members of staff. I totally oppose the increase in the ratio of babies to adults. It is unacceptable to expect one person to be able to give four babies/toddlers the care and attention they need. How do you manage feed time with four babies, who are all crying for food at the same time? If they are all bottle-fed do we revert to the practice of propping babies up with a bottle and the risk that brings? How do you ensure their safety? This proposed ratio jncreases the risks to the babies. It is not possible to provide care and attention to this number of under-twos. This proposal has not been thought through. We need to speak out against this suggestion. Another example of someone outside the grass roots in child care, thinking that giving us an increase in the maximum ratios will save us money! All the comments from child care settings on here are screaming ‘NO! NO! NO!’ and I completely and utterly agree. It will not make any difference to me, I do not operate to the maximum anyway, we are a quality setting and I employ staff to work with children under quality measures – that includes operationally employing lower than the maximum no of children to staff. You simply cannot care for the needs of individual children in your care if you have anything more than the current maximum 1:3 or 1:4 or 1:8 for the age groups 0-2; 2-3; 3-5. What would help me financially has already been stated in some of the messages above – VAT, corporation tax, fair rates, and the ‘so called free entitlement’ amount paid to us. In addition, I would like to see the government consider looking at a revision of PAYE for early years workers, with a specific code that will allow them to retain more of the money they earn, and raise the LEL for them. With RTI impending this would be easy enough to accomplish with little administration to make it a realistic possibility. This is a typical move of government that does not put the needs of children first. This has been the same situation for years – as an ex-nursery teacher the ratioof 3yr olds was 1 adult to 13 children! Now, with a ratio in the PVA sector of 1 to 4, an adult only needs one baby/toddler to be need physical care /behaviour support and the other 3 children are unsupervised! Let alone interacting in quality play with an individual child! And the care of young children should not be seen as an easy option in which to place teenage girls with limited educational achievement themselves. Children are individuals and the fundamental message of the EYFS is that each and every child should be treated as such. The care, activities and experiences planned for a child by their Key Person should be based on their individual needs and interests. How are we to be expected to get to know our children and plan and care for them individually if they are being cared for on mass? Has the Government really gone mad and is this the straw that breaks the camel’s back? First we are asked to support our NVQ3 staff to undertake a lengthy period of study to gain a degree and EYP status with the rug being pulled out from under our feet when the funding is stopped and the qualification devalued when it does not even get a mention in the revised EYFS. Then we are expected to deliver a quality service based on ‘free entitlement’ which to all intense purposes is free to the parents who are accessing it but funded by the setting and/or by fee paying parents for whom it is necessary to charge higher fees to make up the shortfall. Then along comes two year old funding whereby the most vulnerable two year olds are given access to ‘free’ child care and education (there we have that ‘free’ word again and we all know the knew definition of that – as the saying goes “there’s nothing free in this world”), these children can bring with them a whole package of needs usually requiring additional time and support. Just to top it all off we are now required to complete the child’s two year old progress check, with no additional funding or training. We have been informed by our local authority that it is a postcode lottery as to whether a child will be invited to a health check, therefore we assume all responsibility for monitoring, identifying and advising parents in relation to, not only a child’s well-being and learning, but also their health needs. If a child is not attending a childcare setting and does not have the ‘right’ postcode between 24 and 36 months they will potentially miss both the progress check and the health check. Is it not these children who are potentially the most vulnerable of our society who will fall through the loop as they do not access any childcare until they are in receipt of EYFE (post 36 months)? The Government need to listen to the voices of childcare providers to best understand how they can help the nations children and their families. Do they not say themselves “….the EYFS….gives children the broad range of knowledge and skills that provide the right foundation for good future progress through school and life” and “every child deserves the best possible start in life and support that enables them to fulfill their potential”. If we are charged with the responsibility to deliver on this (and inspected on this) through the mandatory requirements of the EYFS then we have the right to demand the support of the Government to carry out the task at hand. The primary factors affecting the cost of childcare are related to business costs. Our business rates tripled in 2010, and we are constantly scratching our heads as to why we are still paying VAT on our purchases, we should be treated as educational establishments. Corporation tax should also be reviewed for childcare providers and allow them to retain more profit for future development and sustainability. More flexibility in ratios and floor areas would certainly help settings manage their staffing costs, particularly around staff breaks, lunchtimes and training. But I agree with others that it will be hard to maintain standards over extended periods. Changes in business rates, corporation tax and VAT are simple calculations that can easily be applied and easily reviewed. This would also add some balance to the fact that the NEG pays no attention to the wide range of premises costs which currently work against quality premises and environments. This idea is not thought through by anyone who works in the childcare sector. Altering the staff/child ratios will not mean more childcare places, because this is governed by space and registration with the relevent body, or are these to going to be altered. All that will happen from an alteration of ratios will be stressed staff, children not getting the individual attention they require and are entitled to, the quality of care and education will suffer. The Government needs to support the sector and if they want affordable childcare put systems in place to make it possible. They wanted all establishments to have staff trained to degree level and EYPS, but small establishments cannot possibly pay the graduates the wages they need and so establishments like mine support and pay staff to go through to the highest qualifications they wish to achieve and then they move on so as to be able to get the financial rewards their academic achievements warrant. I cannot see how allowing staff to look after more children is going to make it cheaper and better quality? If you are caring for 6 toddlers all in nappies or potty changing, what would you do with the other 5 children? You would still need the 2 members of staff for that age range to cover nappy/potty times! And how would the cost reduce?? A nursery is not going to charge less per session/day/week etc because it can have more children, because the costs are based on mortgage/rent, gas electric, wages, resources needed………etc etc etc!! Ofsted expect us to work to very high standards……this CANNOT be achieved by making childcare cheap and forcing staff to spend less quality time with children. Has the government ever experienced toddlers who need comforting and are in distress because they have extra needs and you need to give that child as much one to one as you can. Throw 5 more toddlers into the scenario who have squabbles, tantrums, want feeding, rocking to sleep etc etc………the children just won’t get the care they deserve as we mere humans only have one pair of hands!!!! How are you supposed to take 6 toddlers on an outing with one member of staff for those children, never mind 4 babies for another member, you’d still need more staff and end up paying more wages so there is no way i can see the fees being reduced by this ridiculous, unthought through proposal!!! I will be extremely shocked if this is allowed to happen!!! The only thing that increasing child to adult ratios will do is decrease the time staff can spend with each child. It will not reduce the numbers of staff but is more likely to increase the numbers of children a setting can take if they do not already operate at full capacity, and this will not necessarily reduce the charges made to customers. What everyone needs to realise is that actually charges are still very low for the quality of care that children receive especially considering the amount of time the “paperwork” takes as well. Perhaps the powers that be should start to recognise the true and actual cost of delivery and reflect this in the Early Years funding which is woefully low and nowhere near covers the actual cost of delivery. I also note the hint that the more qualified a person is the better able they are to look after more children! Uuuum – so a degree level member of staff can really watch over and care for more than 4 toddlers at a time and still have sufficient capacity to “teach” them something – I don’t think so!! Staff will want paying more money for the extra responsibility of having more children where do they expect small businesses to find the extra?? Most good quality settings already run a lower than legal ratios in order to keep children safe and provide excellent opportunities for all children. Ratios are a maximum, not a requirement. This means good settings will keep to their lower ratios and it will make no difference at all to the amount of child care places. Settings who allow the children to at a higher ratio will naturally have less time to offer to the children and quality will be reduced. It is a pile it high sell it cheap attitude that may work in supermarkets but do we really want that ethos applied to the next generation of children. The answer is obvious to all that run nurseries, allow parents to have the NEG as credit towards children’s education so they can chose how to spend it and where. They can have less hours at an expensive setting and more at a cheap one. If settings can charge a sustainable rate instead of subsidising the NEG children. as they do now, they will naturally be able to expand and invest. New nurseries would open knowing that they could afford to have three year olds at their setting with out subsidising them from the own pockets. The NEG is not free education for children …It is subsidised education for children. the government give you a voucher to spent at any shop to buy a dress – you can go to your local supermarket, choose any dress and regardless of how much the dress actually costs the government will pay the amount that they deem acceptable, lets say £50 – you may on the other hand choose to go to Harrods, you select the dress you want and again, regardless of the actual cost of the dress the government demand that Harrods MUST let you have the dress and they will pay Harrods only the £50 that they have decided because very one should have their choice of dress and not pay any more for something that is of vastly superior quality. Reverting back to the system we had before when parents chose where they spent their funding and if the cost is not covered they have the choice of free places at another provider or paying for the nursery that provides more facilities, trained staff, lower staff/child ratios. Changing the ratios is a very short sighted solution, providers seeking to offer the very best care will not want to work at these levels because they know the standard of their provision will suffer. Absolutely not. I have worked in early years as a childminder, in nurseries and as a nanny. I have seen many changes over the thirty plus years. Some have been good and some ill-advised but this just beggars belief. Even if you could cope with the physical care which is still quite significant, particularly difficult if you have some children who have additional needs, but would make it absolutely impossible to cater to their considerable emotional needs , not to mention the huge pile of paper work. Cattle are meant to be kept in herds, children should be nurtured, loved and shown that they are unique and valued. when would you find the time for that? About time that pen pushers got out of the office and spent time in the real world where children are people, not numbers on a piece of paper. Changing ratios will not affect the number of children we can cater for unless space requiremens also change. We generally have more space than the minimum requirement but costs at the margin are high. You have to have the capacity for the maximum additional children that one member of staff could look after given the specified ratios. The government is in danger of putting the cart before the horse. If they claim that graduates can look after more children than those less academically able, we need to have those graduates in place before changing the ratios or are they, by their own reasoning, prepared to put a generation at risk? How does this increase quality? (re Whitehall source comment). This would certainly impact negatively on the quality of childcare- resulting in much less meaningful interaction. What happens when a 2 year old is upset, and the worker has 5 other 2 year olds to look after and to engage in stimulating play? 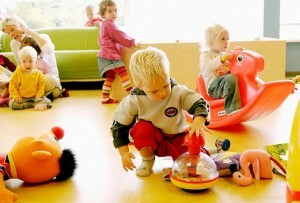 This would lead to larger groups of children being in the same room, so lowering the space for play. Again we see Early years being devalued by this governement. By increasing staff/child ratios you will still not be able to free up spaces for more children if you are already at the limit of children your building size can hold as the amount of children you can have in one nursery depends on the age of the children and the m2. What this will do is give the nursery the ability to cut jobs to save money. I strongly disagree with the government’s plan to increase staff to child ratios. The staff within my setting have a mutual agreement that highering the ratios will inevitably lead to a decrease in the quality of childcare. Surely if there are more children per member of staff there will be even less quality time spent with each child, which the volumes of paperwork associated with the EYFS unfortunately already take away. The higher ratios will make it harder for children, especially babies to evacuate a building in an emergency … how is one person supposed to get four babies out of a building quickly? I know that many of the parents attending our setting would also disagree with this bid. Quality childcare has been such a hot topic recently and more and more parents have a greater understanding and expectation of what depicts quality, I feel that parents would be very disappointed with this bid. I believe that childcare should be made more affordable with support from government finances. Government have made a plea to raise the quality in childcare and in the past few years have supported the Sure start grant scheme, have aided funding of higher education and put a strong valuation of the EYPS. How is raising the ratios in childcare settings helping to support the ethos of good quality childcare. In my opinion you get what you pay for and if ratios are made higher the quality of childcare will be significantly reduced. The government need to see childcare on the same par with schools and support parents and providers better, not sacrifice the quality which we already have. This is early years legislation gone crazy. The current ratio requirement is a minimum requirement and depending upon the mix of children, can actually fall short of good quality care. If this goes ahead Early Years care will be little more than crowd control. Children deserve good quality care and education and early years staff need to be given the time to do this. How can key persons build and grow relationships with children and their families, with these proposed changes? Is there a petition because I would like to be the first to sign it. The concept of reducing staffing levels is a complete nonsense that could only be forwarded by someone who has never worked with under fives or has absolutely no concept of what it involves to adequately and safely care for same. I am entering my 18th year as Principal of Ellingham House and the most trying aspect of my time as such has been dealing with the oh so many nonsensical and truly ignorant initiatives emanating from both National & County administrators. If you want quality, you have to pay for it – pure and simple. And please let the misnomer and lie of “Free Nursery Education” be vanquished soon – it will only be truly free if the payment made to settings by County/Gov. equates to the standard fees they normally charge. This won’t increase the number of children that a setting can care for because that number is determined by space and registration. It just means a setting will need less staff to operate, potentially leading to job losses. NO. Otherwise why not 1 to 60 as in the erstwhile Rumanian orphanages? Makes it cheaper…but then we only just improved conditions for our battery hens, despite the increased costs. What ever happened to evidence-based policy making? Has anyone seen the research on this?